Try this refreshing dish for breakfast or as dessert. Pour pineapple juice into medium bowl. Rinse apples and dice (throw away stem and core). Place apples in pineapple juice. Toss to coat. 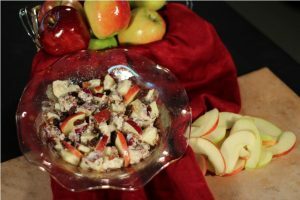 Add chopped pecans and raisins to apples. Add vanilla yogurt to apple mixture. Stir well to break up clumps of raisins.